Quilting idea's for a quilt. 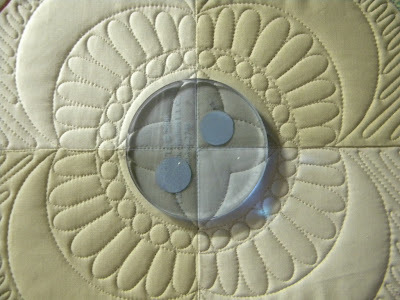 I wanted to share with you my quilting idea's for Patsy's quilt. The first thing I did on this quilt was decide what I wanted to quilt on the border. I decided to quilt a freehand feather, swirl, pebble filler. Now that the border quilting design was determined, I knew I wanted to carry those same designs throughout the rest of the quilt. The other quilting design I wanted to add throughout the quilt was the straight line, piano key like quilting, I did on the outer border. I took each block and added one of those border quilting designs to it. My background fillers were either a swirls, feathers or pebbles. I mixed some feathers and pebbles on this one. I also wanted this block to stand out because it was the center block and by adding some triangle corner frames...really gave this block a different look and gave it that pop I wanted. I used the straight lines in the triangles here. There were two of these blocks on Patsy's quilt and I quilted them the same. As you can see I've used feathers for the center and some straight lines on the sides. I also quilted a parallel line 1/4 inch in from the sides of all the blue blocks. By doing this, it really helped separate the blue blocks from the green blocks. ..so the next time you are stumped as to what to quilt on a quilt, try to determine your quilting design for your borders first then take those same quilting designs and use them throughout your whole quilt. Isn't this a fun little flag quilt! This quilt belongs to Lisa and her piecing was beautiful. I wanted the quilting to take on the elements of a flag. Stars in the corner and horizontal red and white stripes. For the stars, I did all straight lines using a ruler as my guide. For the red and white, I made all my quilting horizontal. Some feathers going from left to right and also stitch in the ditch and straight lines with the ruler. I used double batting. Warm and white on the bottom and Hobbs on top. Why did I mix the two? When using the Hobbs on top, it gives it a little bit more puff...plus it's all I had for scrap batting that fit the size of this quilt. I save all my scrap batting in hopes to use it for runners and baby quilts. Bonus for the customer...I don't charge them for it. This quilt, quilted up fast and fun! I quilted up a motif and feather ring on Lisa's Beautiful quilt. This video is very un-professional, but you'll get the idea of how I do them by watching it. I also wanted to share a couple of things, I didn't mention in the video. The arch ruler is by Renae Haddadin. The green ruler is by Gadget Girls. 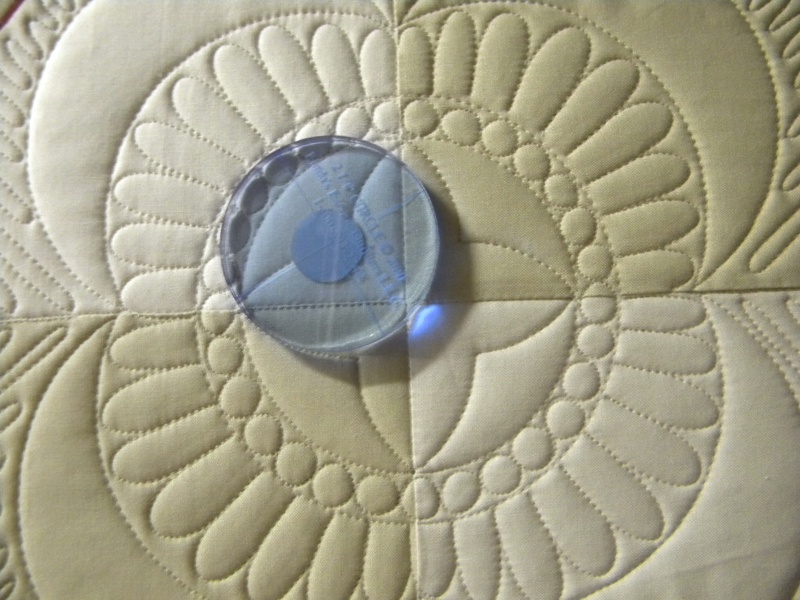 The circle template is by Linda's Electric Quilters. I switched my top thread to a dark tan for the feather ring.